Beverly Cottman. Nov. 10, 2012. 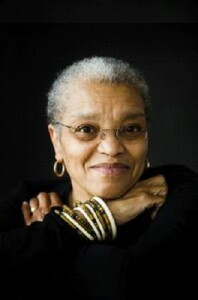 Beverly Cottman is an interdisciplinary artist creating at the intersections of visual, literary and performance art. As storyteller “Auntie Beverly” she tells folktales and fables from the African Diaspora. As a member of the Ways Ensemble, (Bill Cottman, photographer, Kenna Cottman, dancer/choreographer and J.Otis Powell!, writer and poet,) Beverly has performed in collaborative productions at Pangea World Theater, Hopkins Center for the Arts and the Avalon Theatre. Her collage/assemblage and found object sculptures have been exhibited at the Minneapolis Institute of Arts, Obsidian Arts (Minneapolis), the ARC Gallery (Chicago) and Homewood Studios (Minneapolis). Beverly shares her interpretations and outlook on literature and creativity in the Givens Foundation for African American Literature Spirited Minds and Strong Souls Singing program. She is also a Teaching Artist with the VocalEssence WITNESS Schools Program. Her creative endeavors pass on values, instill pride, evoke self love and celebrate culture. She draws inspiration for storytelling and performance art work from her role as “Gramma” to Yonci Peaceful and Ebrima Baye. She is a modern-day “griot” delivering wisdom of the ages in a voice of the present for the future. Moe Lionel. Nov. 10, 2012.